CBOE has paid a quarterly dividend since 2010. It's not optional: Shareholders of record on May 31 will receive a quarterly dividend of $0.15 per share on June 21 from futures and options exchange operator CBOE Holdings (NYSEMKT:CBOE), the company announced this week. CBOE has paid a quarterly dividend since 2010 and in December 2012 paid investors a special dividend of $0.75 per share. The exchange operator paid the dividend out of cash on hand, paying approximately $67 million. CBOE, as the largest U.S. options exchange and creator of listed options, is the holding company for Chicago Board Options Exchange, the CBOE Futures Exchange, and other subsidiaries. The most recent dividend payment equates to a $0.60-per-share annual dividend yielding 1.6% based on the closing price of the stock on May 1. CBOE Dividend data by YCharts. 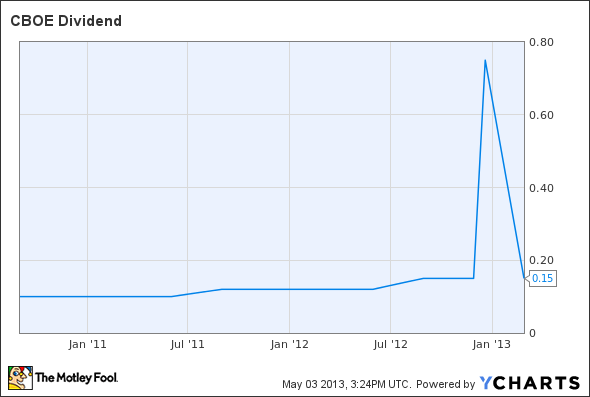 Chart reflects special dividend of $0.75 per share paid on Dec. 28, 2012.